Hundreds of wounded warriors from around the world are in Toronto for the Invictus Games, with Prince Harry on hand to kick off Saturday night's opening ceremony. Hundreds of wounded warriors from around the world descended on Toronto for the Invictus Games Saturday, with Prince Harry on hand to kick off the night's opening ceremony. Prime Minister Justin Trudeau, Ontario Premier Kathleen Wynne and Melania Trump joined Harry — the founder of the Games — at the Air Canada Centre for the festivities that included a star-studded show featuring performances by Sarah McLachlan, Alessia Cara and the Tenors, along with a "parade of nations." Trudeau was among the first to speak at the ceremony. "To the competitors, through your athleticism, through your drive and your competitive spirit, you are showing the world that illness and injury can actually be a source of tremendous strength," Trudeau said in his address at the sold-out event. "We know that no one leaves a battlefield unchanged and that not all scars can be seen." 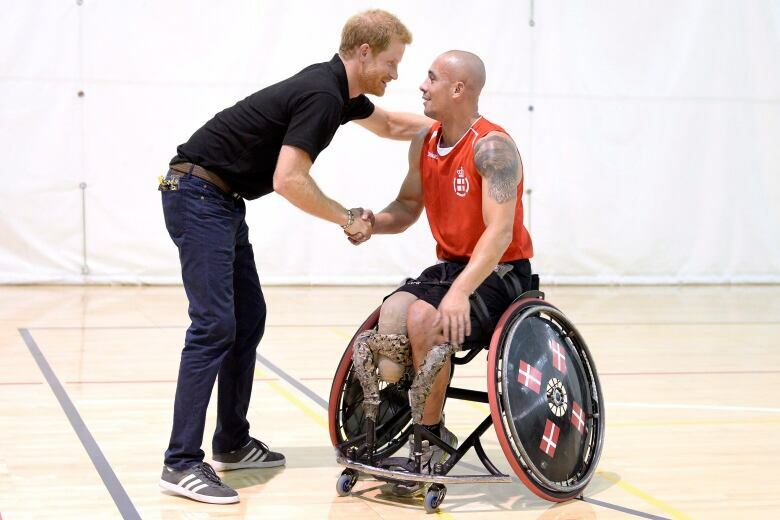 Prince Harry started the Invictus Games in 2014 as a way to inspire and motivate wounded soldiers on their paths to recovery. And before the games were officially declared open, he took to the stage to explain their meaning. "In a world where so many have reasons to feel cynical and apathetic, I wanted to find a way for veterans to be a beacon of light, and show us all that we have a role to play. That we all win when we respect our friends, neighbours and communities. That's why we created Invictus," said Harry. The true scale of that, he said, was brought home to him when he left Afghanistan after his first deployment there in 2008. He shared the plane home with the coffin of a Danish soldier loaded on by the man's friends as well as several wounded British soldiers, he told the audience. "The way I viewed service and sacrifice changed forever, and the direction of my life changed with it," said Harry. "I knew that it was my responsibility to use the great platform that I have to help the world understand and be inspired by the spirit of those who wear the uniform." Before he closed, Harry addressed the competitors directly. "You have all come such a long way... Now you are here on the world stage, flags on your chests, representing your countries again, supporting your teammates and looking up into the stands and into the eyes of your families and friends. You are all winners." The Games for wounded and sick soldiers, including current and veteran members of the forces, run until Sept. 30. At least 550 competitors from 17 countries are slated to compete in 12 sports. 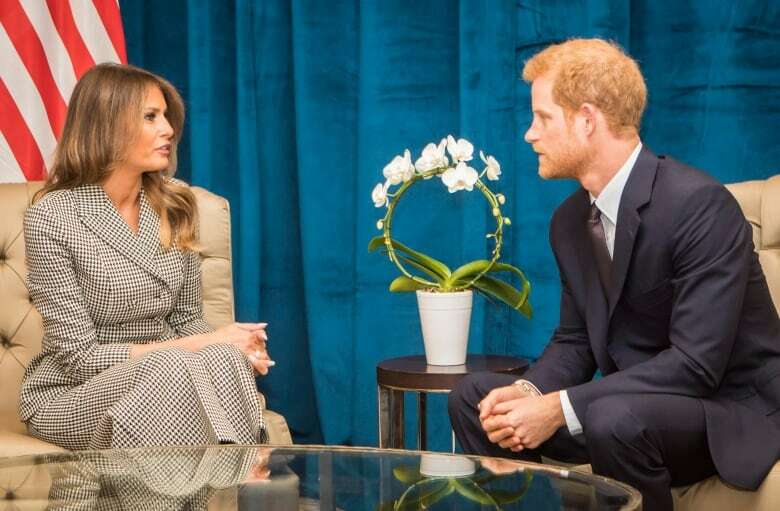 Earlier Saturday morning, Harry toured the Centre for Addiction and Mental Health (CAMH), where he participated in two roundtables — one with nine senior staff members focused on research, the other on dealing with youth coping with mental illness. At a news conference featuring an emotional Mike Myers, Canadian comedy icon, organizers said that sports fans will "see things you've never, ever seen before" on the field of play. "These Games aren't about the finish line. These Games are all about making it to the starting line," said Michael Burns, chief executive officer for the Toronto 2017 organizing committee. "For those who have arrived in and around Toronto in the last few days, that, in and of itself, is a major accomplishment." Melanie Harris, 42, is set to compete in bioarchery at the Games. She spent 20 years in the Armed Forces, serving four tours, including two in Afghanistan. "An international stage like this allows us to share our journeys and to tell those veterans that 'you are not alone.' Reach out that hand and someone will be there." Harris lives with post-traumatic stress disorder (PTSD) and lingering pain from a back injury sustained overseas. In 2008 she was assigned to a multinational medical unit in Kandahar, Afghanistan, where she carried the wounded and dead on stretchers into the hospital. The horrors she witnessed there made an indelible mark. She returned home in a state of inertia. "I was living without purpose. I needed to believe in myself again, and I needed to be inspired," she said during the news conference. "These Invictus Games, that's what they did." Ultimately, Harris said, she'd like to show other people living with injuries, mental or physical, can excel at sports and other physical activity. "The world of adaptive sports is about will." 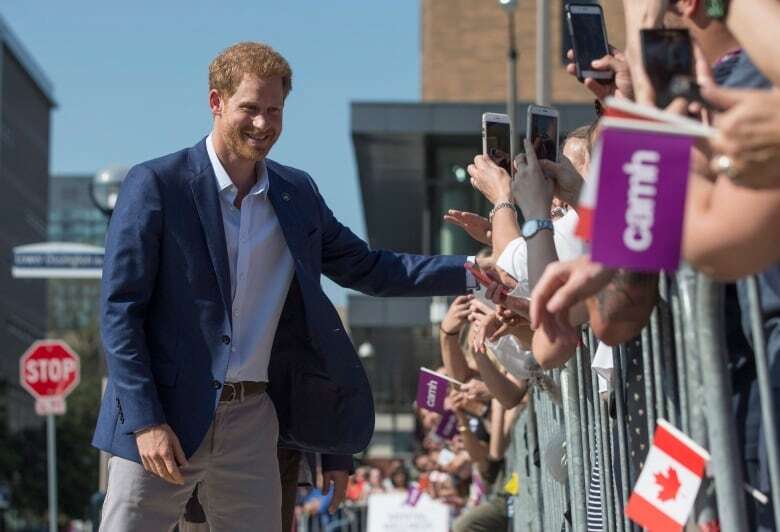 During Harry's visit to CAMH, hundreds of spectators waited patiently behind a barricade in unseasonably blazing sunshine for a chance to get a glimpse of the prince. The prince did not disappoint, crossing the road after his tour to talk to children, meet a pup and shake hands with members of a crowd that whooped when they glimpsed him and called his name repeatedly. "Oh my goodness, I'm so happy he shook my hand," said a dazzled Robinowe Bukirwa, who wondered if she was dreaming even as the prince faded into the distance. "I don't think I'm going to wash my hand today. I'm so very excited." Dressed in a blue blazer and grey slacks, the British royal stopped briefly to chat with those gathered and thanked them repeatedly for coming out. Harry then set off for meetings with Gov. Gen. David Johnston, Trudeau and Melania Trump, who's in Toronto with the U.S. delegation. Trump's decision to lead the U.S. delegation, whose members include Veterans Affairs Secretary David Shulkin, professional golfer Nancy Lopez and entertainer Wayne Newton, reflects her "utmost respect" for the hard work, courage and sacrifice of the U.S. military, said Stephanie Grisham, a spokesperson for the first lady. Grisham said Trump also has "great admiration for the role the games have played in empowering those who have been injured while serving."